In honor of the recently released Mingus live recording from 1973, Jazz in Detroit/Strata Concert Gallery/46 Selden, I have created a Mingus network graph detailing his many recordings and songs, using data from the MusicBrainz database. This new recording is not part of the network, but many other classic Mingus works are detailed. This graph shows Mingus at the center, surrounded by his many recordings, with individual songs connected to the recordings where they appear. Songs are sized based on the number of recordings they appeared on, providing a quick glimpse into Mingus’ most notable tunes. Use the zoom and pan controls as well as the search box to navigate the graph. 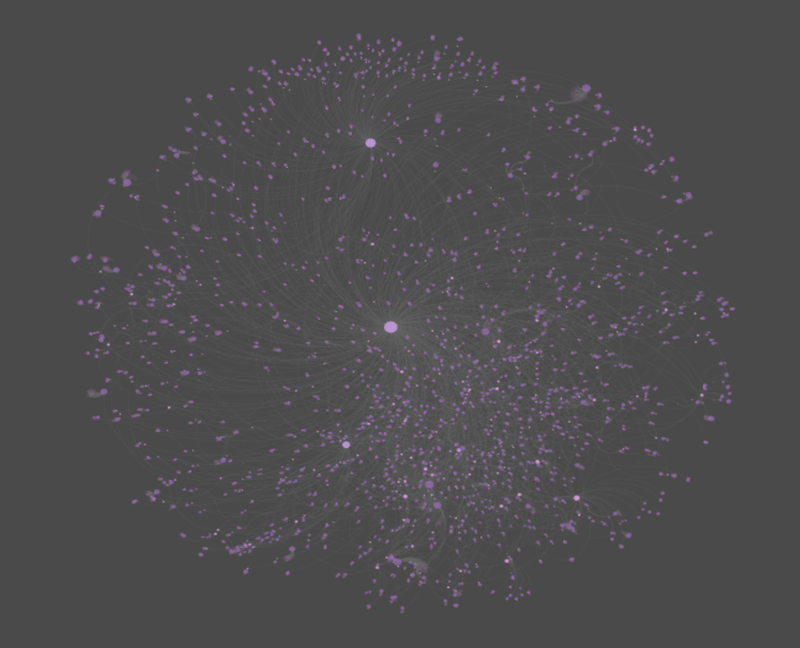 The data is sourced from the MusicBrainz database, while the graph is built using Gephi and sigma.js. Here’s a link to the live version – enjoy! In an effort to make all graphs stylistically consistent with the look & feel of this site, I have managed to change the base text for the graphs to the stylish Rokkitt font, as seen in the title of the image below. The Rokkitt font has a unique style that seems quite appropriate for jazz networks. You may have also noticed the large bubble in the network graph, which represents the lens capability provided for scanning the graph. I have recently updated the lens settings to enable easier browsing of the network. You can activate the lens by clicking on the magnifying glass in the lower left of the screen. While the lens is great for browsing the graph, you may find it easier to make individual selections with the lens deactivated; simply click the icon a second time to toggle the lens to the off setting. As a reminder, selecting any graph node will display all linked entities in the graph, as seen below. All links in the left panel are now also featuring the Rokkitt font. These style modifications will be applied to all future jazz graphs, as I work to create informative, easy to use, stylish network graphs. Thanks for reading! One of the great strengths of the MusicBrainz database is that we can build networks using not only artists, but also record labels, or even individual songs. In this post, we’re going to explore an example (per a reader suggestion) using the ECM label and its variants. ECM is known for producing high quality recordings from an array of both jazz and classical artists. Keith Jarrett, Charles Lloyd, and Gary Burton are among some of the better known artists with multiple ECM recordings. The four sections of code are united by one common attribute – the four record label identifiers associated with ECM. Section 1 creates nodes for the record labels, section 2 the recording artists, section 3 the releases, and section 4 the songs on each release. This should give us a very interesting network, although it will not have the same level of cross-pollination as the earlier Miles Davis network, as the songs are being associated with specific releases. Here we are simply connecting labels to artists, artists to releases, and releases to songs. 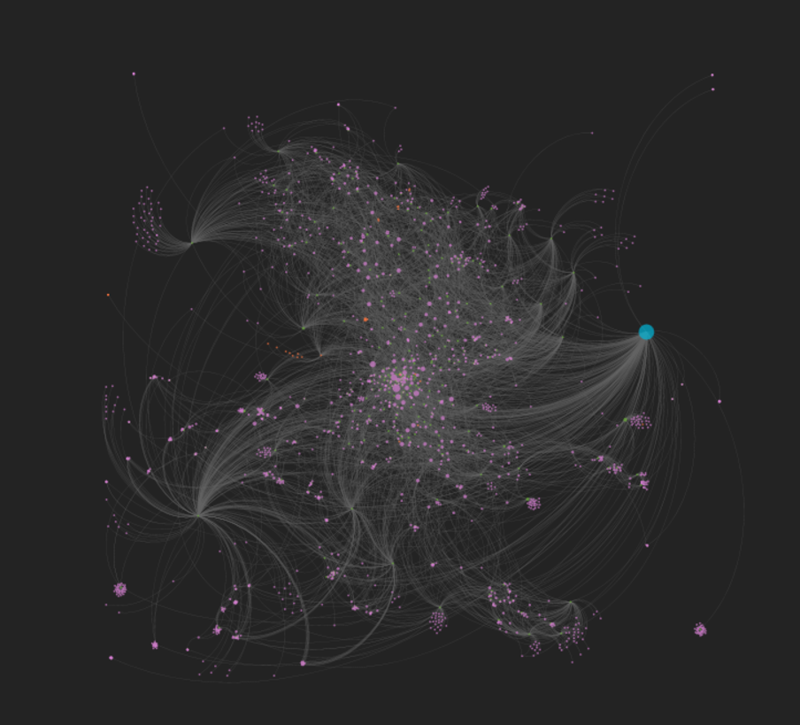 Both the node and edge results are saved to .csv files for use in Gephi. Once the data was in Gephi, I spent parts of a few days testing layouts, spacing, colors, sizing, and so on, before settling for the moment on using the popular Force Atlas 2 algorithm. I find it useful to start the process using the rapid (and less precise) OpenOrd algorithm whenever working with a fairly complex or large dataset. Then, once the basic network structure is revealed, we can move on to Yifan Hu, Force Atlas, or any of the more precise methods. To interact with the network, click here. Thanks for reading! 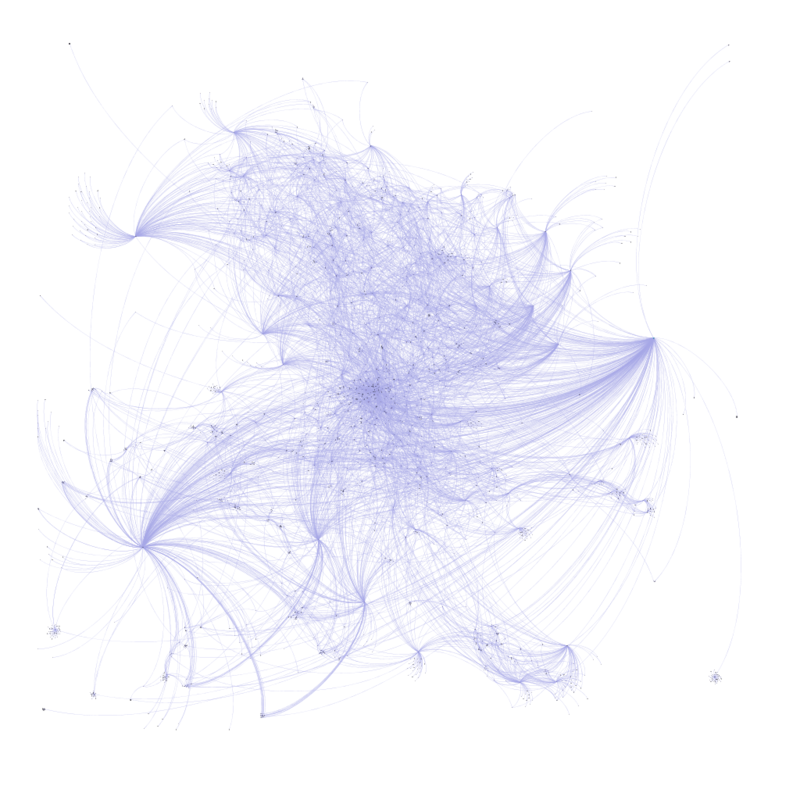 As the initial versions of my JazzGraphs networks are being tested, I thought this would be an appropriate time to walk through the process I use for moving the data from raw database form to the eventual network graph output shared on this site. Mind you, I am still iterating through the data, testing what works best for graph creation, and otherwise seeking to create some memorable output that pays homage to many of the great jazz artists of the last 100 years. Ultimately, the process could change a bit, but it feels like things are pretty stable for the moment. So here goes with a basic outline for the steps currently being taken to create the graphs. While the content in any such site is never perfect (think Wikipedia), it nonetheless provides a fantastic starting point for projects such as JazzGraphs. Fortunately for me (and other SQL coders), the MusicBrainz database is available in a PostgreSQL format, which is very similar to the MySQL databases more familiar to me. So the learning curve has been anything but steep in technical terms. The greater challenge has come in the sheer number of tables and fields in the database, and figuring out which ones are highly populated versus the ones intended for future growth. Another interesting aspect is the multiple spelling variations available for a single song or even an album release. Such are the challenges with public contributions; fortunately they are more than offset by the impressive level of detail available for many artists. So now you have a basic idea for what the database looks like, how joins are implemented, and how the general naming conventions work. Much of the artist information is found in the upper left of the diagram, with release details in the lower left. Works (songs) can be seen in the lower right quadrant, while the upper right is largely concerned with location and label information. Note that this is but a small subset of the more than 300 tables in the database. Once the data is available, the challenge is to understand all the relationships within the data, as well as where to find the most robust tables and fields. As I noted earlier, not all tables are populated equally at this point, so it is critical to work within the framework of what’s currently in the database. Fortunately, for a prominent artist such as Miles Davis, we find plenty of data in some of the key tables. 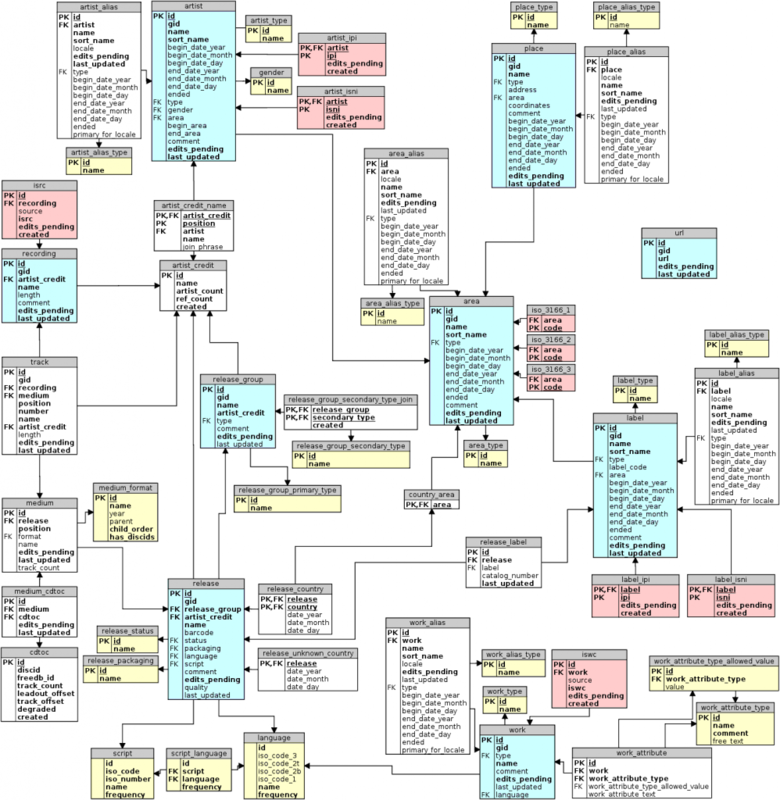 This enabled me to begin testing SQL code, and to also envision how I might wish to display the data in a network graph. After a few rounds of testing, I arrived at the conclusion that using a tri-modal approach might be the best approach. In other words, the artist (Miles Davis, in this case) connects directly to specific releases (an album or CD), which in turn connect directly to the songs on the release. What makes this approach appealing is the fact that many songs show up on multiple releases; otherwise, we would wind up with a simple hierarchical (think organization chart) output, and that wouldn’t be much fun 🙂 . As you may have gathered, the ‘1954’ value for the artist_credit corresponds with Miles Davis’ unique id in the database. The beauty of this code is that we need only modify that id in each of the 3 code sections to pull the same type of detail for another artist. So our code is highly reusable. Once our results have been returned, we simply export the results to a .csv format. Pretty simple – in the first section, the artist represents the source node, and all releases become the target nodes (source and target values are essential to Gephi edge creation). 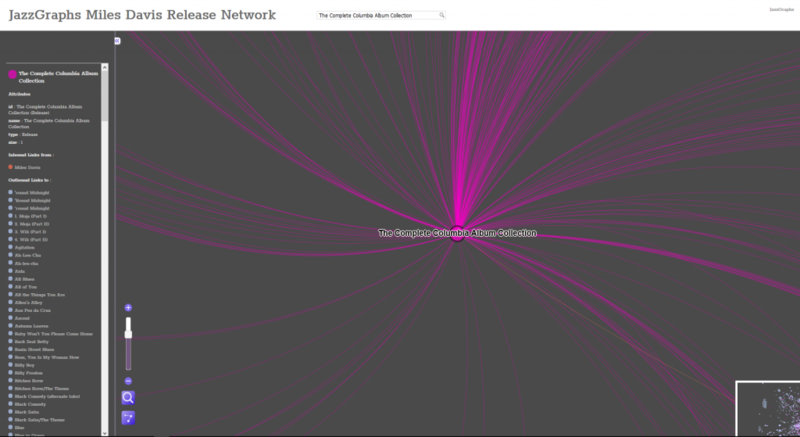 The second section adds releases as the source nodes, and songs as target nodes. This will give us the tri-modal network structure I spoke of earlier. 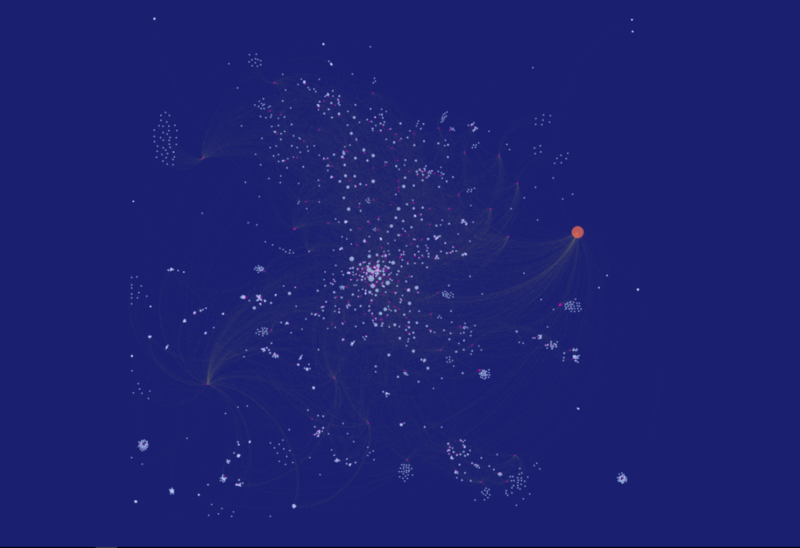 Next comes the fun part (not to say that coding can’t be fun 🙂 ) where we start to use Gephi to create our network.The next post will examine how we pull the data into Gephi and start creating our network. Hope you found this informative and helpful, and thanks for reading! One of my favorite aspects of working with web projects is the ability to use CSS to customize a page. This is especially the case when working with sigma.js for the deployment of network graphs. CSS makes it easy to quickly test and change colors, modify elements, and experiment with different fonts. This is all important when I’m seeking a particular look and feel for a visualization. Which leads into this updated take on my recently created Miles Davis network graph, wherein the node colors, edge widths, and font sizes have all been modified, for the better, I believe. 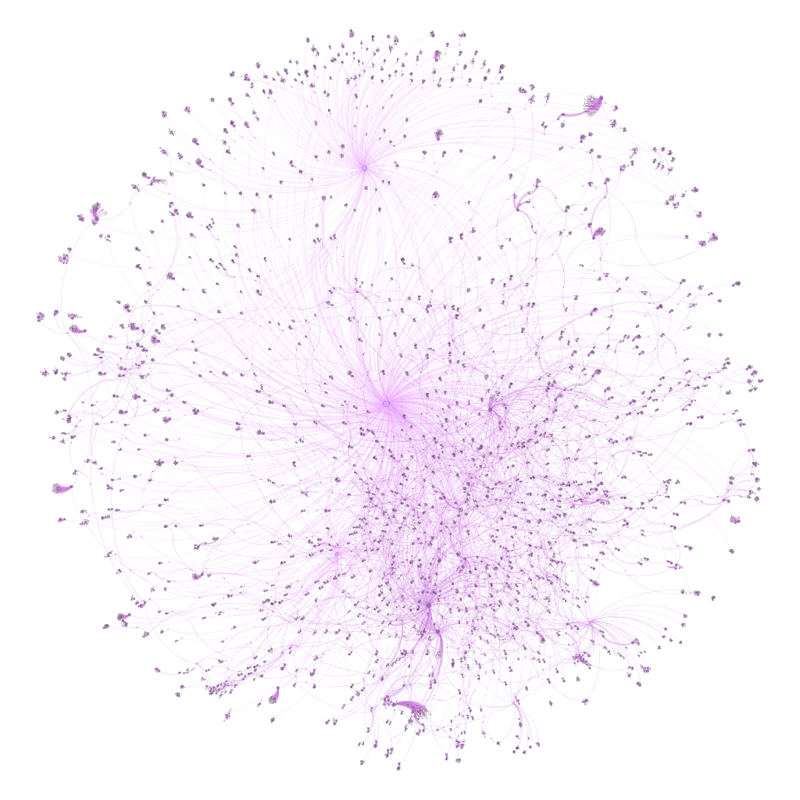 I’ve been spending some time working with data from the MusicBrainz site, and exploring various ways to create networks using Gephi. My initial explorations focus on the vast musical network of Miles Davis, as seen through album releases and the many songs Miles recorded. Here’s a look at one such iteration, wherein Miles is connected to releases, which are in turn connected to songs. Of course, many of the songs are associated with multiple releases, making for an interesting graph displaying all the connections between artist, releases, and songs. Now Miles can be seen clearly, as we have enlarged his node to draw attention to him as the focal point of the network. We can also begin to see some of the most frequently released songs as larger pink circles. Tunes like ‘So What’ and ‘Milestones’ appear on many releases, and are sized accordingly. Of course, one of the best aspects of deploying the network to the web is the ability to offer interactivity, where users can zoom, pan, click, and otherwise navigate the network to learn more. If you wish to do so, click here to open the network in a new tab. Note that this is an unfinished product at this point, despite being several iterations in the making. I have yet to resolve spelling differences that make one song appear to be many different tunes (‘Round Midnight is a classic example), and I also plan to make some other modifications. Having said that, it feels like we’re close to a working template that will allow for depicting the networks of so many of the heroes of jazz – Coltrane, Monk, Ellington, Parker, Mingus, and many more. So stay tuned for periodic updates and improvements, and thanks for reading! Welcome to the JazzGraphs website! This site will feature a variety of visualizations documenting the fascinating history of jazz music – the artists, labels, and recordings that make up this great American art form. 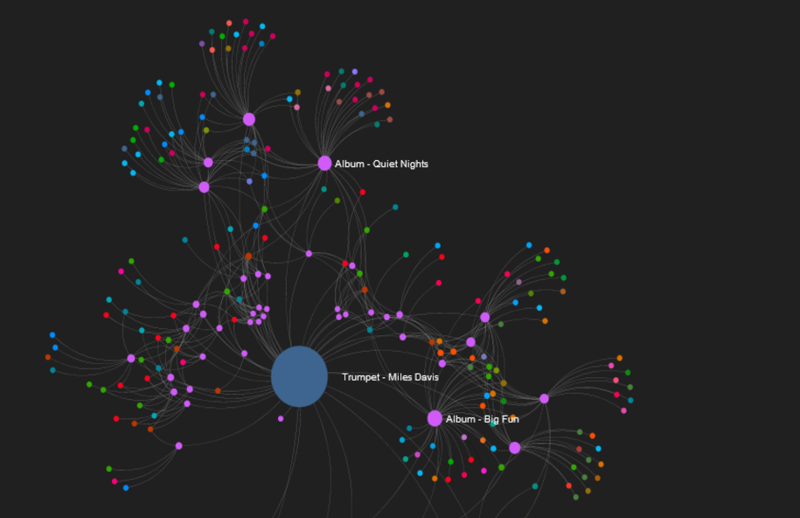 This is a snapshot of a network graph detailing the studio albums of jazz legend Miles Davis, along with all of the sidemen playing on each recording. Many of the visualizations will take this general form, but other data visualization approaches will also be utilized. Lots of the graphs will be interactive, allowing you to have a fun exploring the myriad relationships surrounding an artist, label, or recording. The eventual goal will be to turn some of these graphs into printed posters and a book sometime in 2018. More details on timing to follow in future posts.